The Truro Heights Pedestrian Bridge is a single span, 45m long, single box girder bridge supported on fully integral abutments founded on steel piles driven to refusal in bedrock. 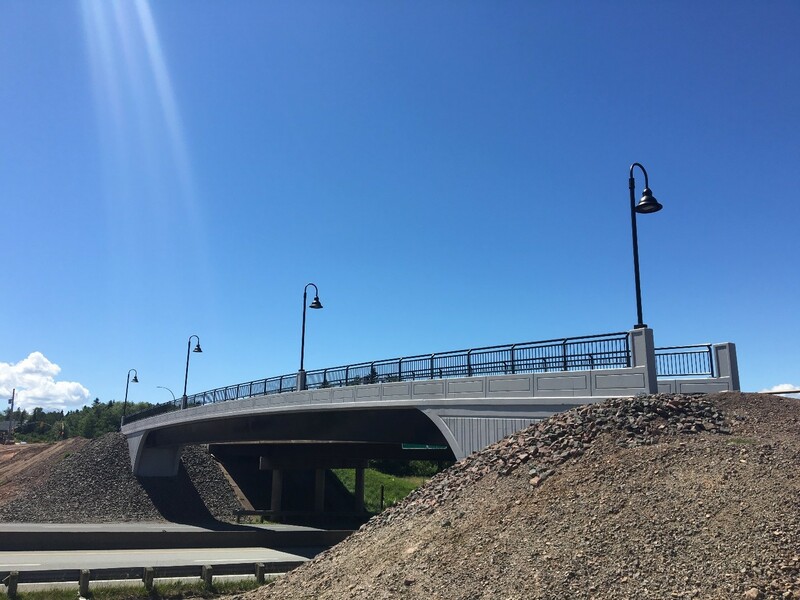 The bridge spans over Highway 102 and forms a vital part of the new pedestrian trail linking Truro Heights to the recently constructed Rath Eastlink Community Center. Harbourside Engineering Consultants (HEC) provided the structural bridge design services for this project as well as site inspection services during construction of the bridge. HEC also developed the innovative girder erection method which mitigated the amount of disruption to commuters on Highway 102 below. HEC’s erection method included casting the center portion of the concrete bridge deck onto the steel box girder prior to delivering the girder to site and completing a double crane lift from the adjacent McClure Mills Interchange Structure. The girder erection was completed during a 20 minute full closure to Highway 102 below, early on a Sunday morning, to minimize the disruption to the travelling public. Following erection of the girder, the remainder of the concrete deck and concrete barriers were cast during single lane closures and no additional full road closures on Highway 102 were required to complete the project.